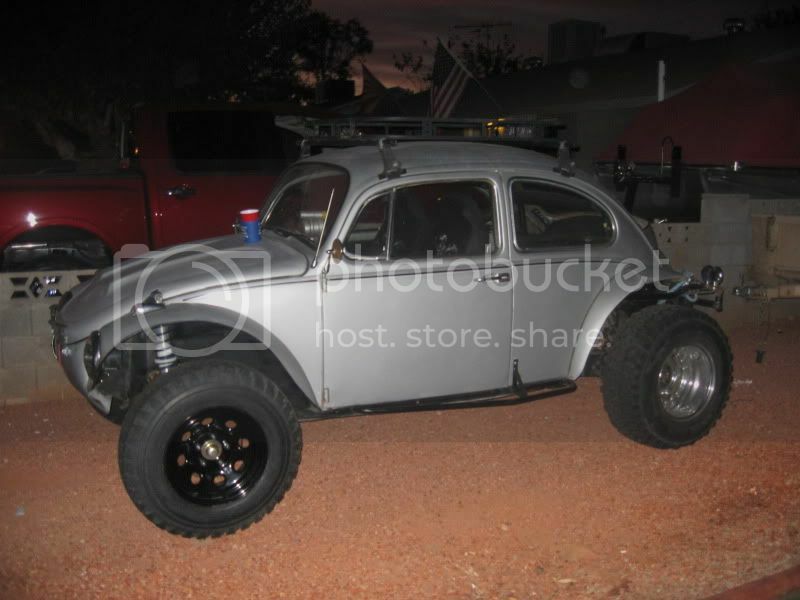 AzBaja.com, Home of the VW Baja Bug -:- Baja Forums -:- AzBaja.com Members -:- Projects and Builds -:- My new 67 Baja that Daryll is fixing for me. Baja Forums -:- AzBaja.com Members -:- Projects and Builds -:- My new 67 Baja that Daryll is fixing for me. My new 67 Baja that Daryll is fixing for me. Post subject: My new 67 Baja that Daryll is fixing for me. Picked up a 67 Baja today that has 4 wheel discs, cutting brakes, 3x3 rear arms, 930 CV's, wider link pin beam with 2 1/4"x4" extended arms, 3-rib bus box, 1835 with single weber, 2" Bilstein coilovers in front with 200/250 springs(too stiff! ), and Bilstein shocks in back. It's got a half cage in it that the rear shocks mount to. Dash is all Autometer gages. Now for the bad. The frame horns need Daryll's help badly. The last owner hacked into them to make room for the 3x3 mounts. It's leaking oil from where the lines go out to the oil cooler. The wheel bearing on the front are either shot or the wrong ones. Tons of play when you rock the car side to side. The shifter is messed up and it's missing a speedo cable. Daryll is going to fix the frame horns and reclock my torsions. Also a good chance to see if they have been upgraded or not. Also going to reinforce the front. He is also going to remount the front bumper that got removed when the car was converted from ball joint to link pin. Then hopefully I can hit some trails until next summer when I will send it back to Daryll for a rear coilover conversion and to finish off the cage. I also want to give it the full race carbon fiber bodywork treatment. Silver and carbon should look pretty sweet. Nice score. I know Daryll will fix it right. Post subject: Re: My new 67 Baja that Daryll is fixing for me. I will post some pics as we go. Looks like youn have a lot to start with. Nice find. Here are pics of the rear frame horns. The P.O. or whoever welded in the pivot brackets neglected to fill in the area around the bracket after welding them in which resulting in the passenger side cracking about 95% of the way around. Its litterally hanging by a thread. The bolt on the driver side pivot was cross threaded and snapped off when we tried to remove it. (see pic). Yum. Just got to love broken bolts. Good thing they left a hole for the torch to fit. Another fine example of how not to do an IRS conversion. Good thing you got it over to Bugzilla it did not look like it had many miles left before the engine would drop. You are probably right Perri, the rear of the frame horns were not tied into the cage either. We will fix that. Just wait until they get to the front, lol. The front beam is welded in crooked and the springs on the coils are binding the trailing arms. Maybe I didn't get such a good deal after all. At least Daryll will make it right. Is that my back seat I see in one of those pics? I would like to know more about that rack that clamps to the rain gutters. With no cage in mine something like that would be in my future. however measured or far away "
I think it's a Yakima rack? Maybe Daryll can look and see what it says on it. It just clamps on. Looks pretty sturdy also. I will be at Daryl's the first week in Dec. for a transaxle swap. Sure hope you get yours straightened out by then. Bummer on the surprises. If your around then maybe I will see it. Yes its a Yakima rack. It fits VERY nice. The clamps are top notch that hold it to the gutters. I searched the Yakima site but did not see anything like it with the gutter clamps. Go to fit my car. Use a 1979 VW Bug. Then click cargo and 3 person family. Then when it gives you the option choose build your own. You will get the 1A raingutter holders($229). Then chose the Megawarrior rack($349), it's on the 3rd screen after the initial cargo boxes. That's as close to what I have as I can find on that site. Just ordered a new link pin frame head from Chirco for $144 shipped. Daryll is almost done with the rear. Had to add limit straps and modify the engine cage also.